I had such high hopes for this book but only a few pages in and I knew I was not going to like it. But I thought I would give it a chance since it was easy to read and I was hoping it would improve. But as you can see from my rating, it didn’t. Before I tell you what I didn’t like in the book, let me tell you about the plot. 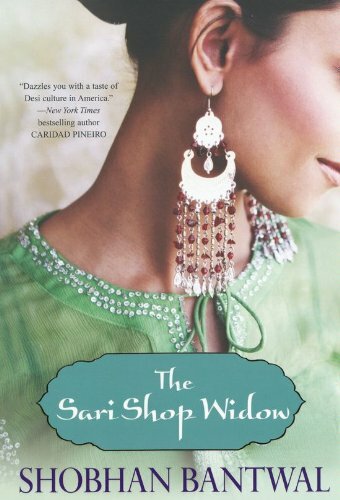 Anjali Kapadia, a 37 year old widow, owns a high-end boutique of Indian clothes and Jewelery called ‘Silk and Sapphires’ in Little India of New Jersey. She lives with her parents who help her manage the store. When her business is suddenly in financial crisis, her father invites his rich and successful big brother, Jeevan to pull them out of it. Jeevan arrives with his rather young and dashing business associate, Rishi, who is a British-Indian and has many successful businesses of his own. Naturally we all know what is going to happen next. Anjali watched her mother flash her most cordial smile and bend down to touch Jeevan kaka’s feet in the conservative way of greeting an elder. So she followed her mother’s example and did the same. It’s be best if she played the passive little Hindu woman–for the moment. Maybe despite her American ways she was still an old-fashioned Indian woman who looked on total fidelity and trust as the cornerstone of marriage. huh? Generalizations are a pet peeve of mine and this novel had them in abundance. The story was also pretty superficial than I thought it would be. It was a simple love story, which I would have loved anyway, if it had a better central character. Even Rishi, the handsome, dashing guy who supposedly every girl dreams of, was always better because he was British-Indian with Indian cultural values thrown in when convenient. I can really go on and on about what I didn’t like in this book. The one and only positive thing it has is a small glimpse into the life of Indian-American families. That’s about it. Read it at your own risk. Swapna’s review is very positive though, so I hope you go read that for a different perceptive. This entry was posted in Adult Fiction, Books, Books read 2011, Reviews, South Asian author Challenge, United States. Bookmark the permalink. I’m sorry you were disappointed with this book. Don’t you hate it when you don’t like the characters or feel any connections with them? Hope the next book will be better for you. I saw this book a few times at the library and for some strange reason didnt pick it up. I might not pick this up.. but yea,i remember swapna’s review recommending it. Oh that is disappointing when you are all set to love a book and it just lets you down! I love that cover though – it really draws you in. Sorry you didn’t enjoy this, Violet. That whole part about being ‘old-fashioned’ in believing in trust and total fidelity is just bizarre. Wow. I love books that draw strong reactions, whether negative or positive. You and Swapna had different reactions and now I’m curious about the book.